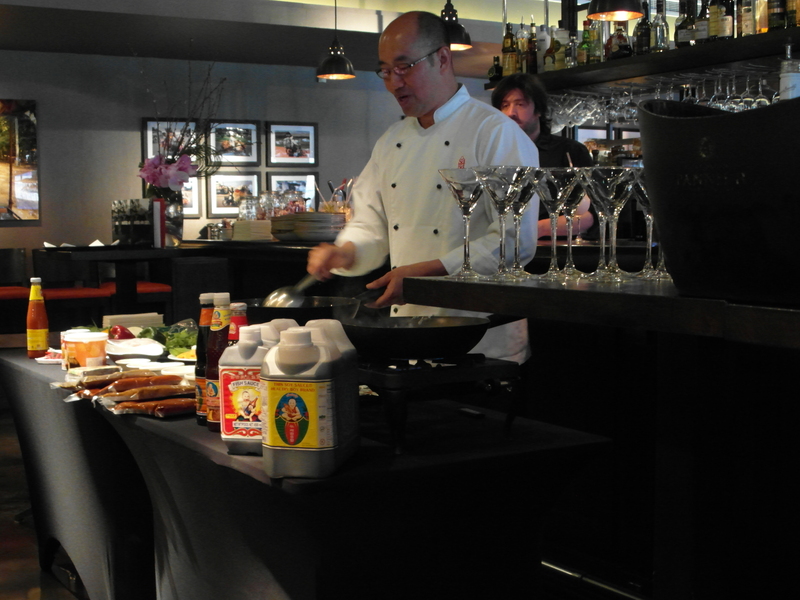 We were invited along to a Saturday cooking and cocktail class recently and it was a delightful afternoon. The idea of this class, which takes two hours out of your afternoon, is that you learn to cook some authentically flavour busting food and learn what cocktail compliment them. The two gentlemen, head chef Tao and head mixologist, ran the class alongside each other, complimenting each other at the pauses with flawless precision. They took volunteers for each dish up to the cooking station to help with the cooking or mixing. After the first dish, we were fighting for a go! They set out the dishes and cocktails prior to class and provided booklets for the attendees to follow the recipes. This was seriously handy because we got to keep them and I could double and triple check what I could and could not eat or drink. Obviously soy sauce was not going to be gluten free, but the rest was easily adaptable for me. 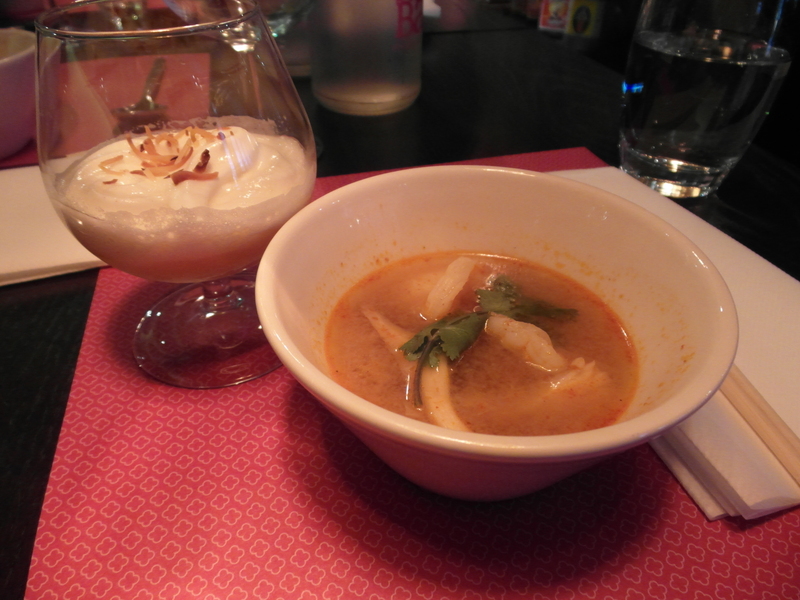 Our first dish was this spicy prawn soup called Tom Yaam Goong. 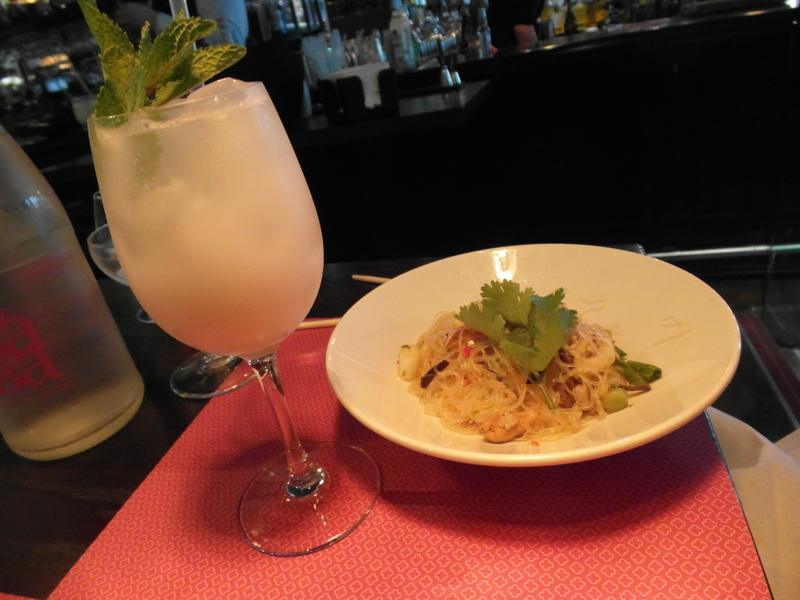 Because of the spice level it was complimented by an "Under the Tropics" cocktail. It had a creamy banana flavour to coat the tongue after the spicy tingles. We were told to have a spoon and soup and then a sip of cocktail and so on. I'm really not a fan of banana, so I may have just had the soup and I can tell you that it was gorgeously spicy. The second cocktail I was a little iffy about as they said it genever, which they described as being distilled through beer. Red flag for me, so when they asked for a volunteer to help make it I hopped on up! To be safe, because he was unsure, we substituted gin for the genever, which as it turns out was what they had started making the cocktail on. It was delicious anyway! The dish it accompanied was a salad, and no, it does not look like a salad as we know it! This was an asian salad called Yamm Woon Sen, a Thai Spicy Glass Noodle Salad with minced pork and prawns. I had a go at chop sticks with this one, after about 10 minutes and 3/4 of the dish I gave in so I could finish it all. I cleaned the plate, great proof I enjoyed it at least! During the whole presentation Chef Tao was instructing the attendees on the composition of the dishes and giving tips on ingredients. He recommended the smaller Asian shops for ingredients, rather than the larger superstores. I asked about substituting Tamari sauce for Soy sauce and he suggested the fish sauce for these dishes instead as it packs more flavour. Another great tip is when your meat is 70-80% cooked, add your veggies because if not your meat will be overcooked. I couldn't eat the third dish as is contained soy sauce, but I could have the cocktail. I asked my neighbour if I could have a quick pic of her dish, which was called Xao Xa Ot. The cocktail was the Garrigue and was close to our mixologists heart as it reminded him of the South of France in taste and fragrance. It reminded me of fields of hay, but hey, everyone gets their own tastes from these things! 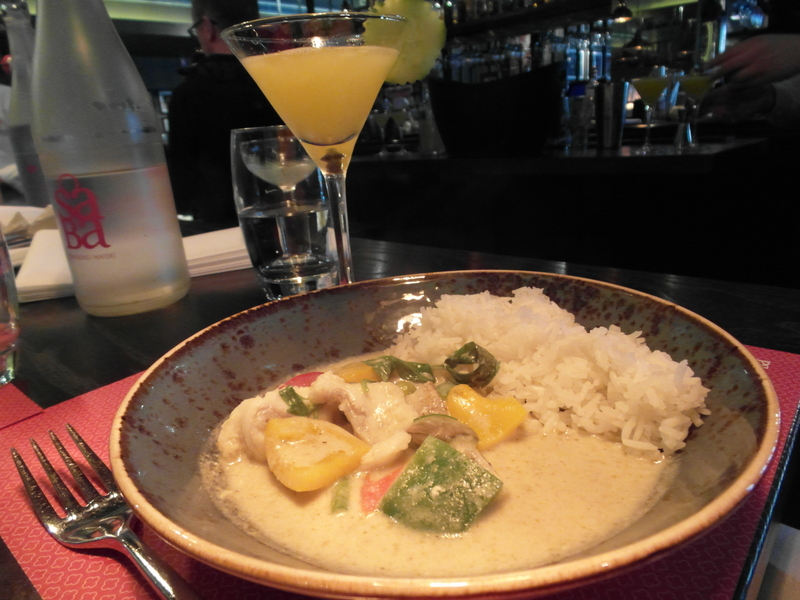 The final dish was a green monkfish curry (Gaeng Kiew Wnn Pia) accompanied by Mango and Cucumber gimlet. This dish was so creamy without having that texture of cream. The monkfish was perfect, but the most pleasant experience of this dish was thai pea aubergines that burst in your mouth and filled it with flavour as you bit into them. Overall, this was an excellent way to spend an afternoon. Although it'd be great any Saturday afternoon, I'd particularly recommend it for a birthday or a hen party as an fun and filling afternoon activity. Saba has never let me down on the gluten free or flavour fronts. They are dealing with more and more allergies everyday, according to the manager. This is definitely one of the gems of the town and between themselves and Saba To Go they have a variety of price ranges to cater for everyone.